It was a busy week for me, starting off with a birthday celebration, culminating with Star Wars Day, and it happened to be my last week of teaching at Chicago State. I have a fake facebook account floating around on the interweb. My original intention was to use it to snoop into other people’s lives and maybe take advantage of a special offer or two. Since the birthday I entered on that account is false, the few real friends of mine who found the account typically wish me a happy birthday some time in the fall. 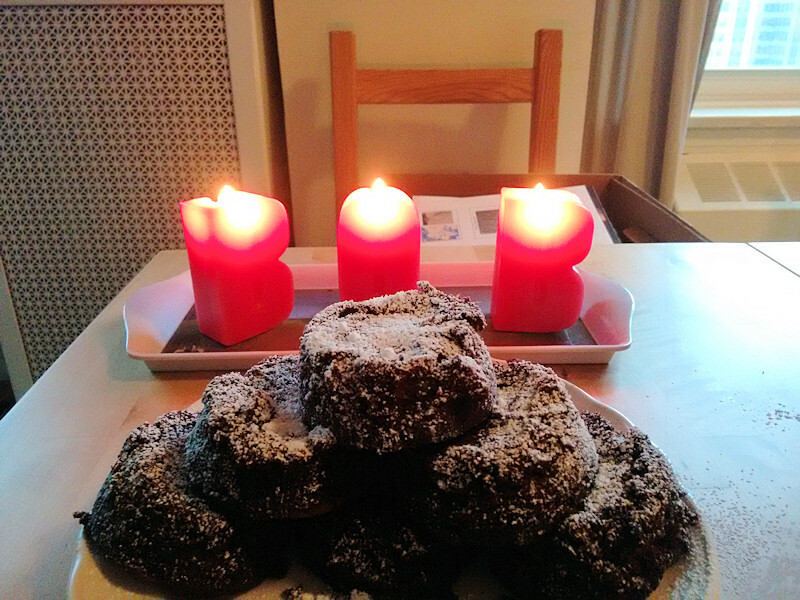 Fortunately, my wife doesn’t do facebook either, so she isn’t fooled by the alternative facts found on-line and knows when to really celebrate my birthday, and she did so this year with a pyramid of lava cakes. Full disclosure, this picture does not have enough calories in it, so coffee ice cream and freshly made maple-syrup flavored whipped cream were added post production. The Chemistry and Physics department at Chicago State has a long history of celebrating the end of the semester with a party for students. While we’ve recently changed the format, traditionally, the event was a pizza party where faculty would bring in home-baked desserts. Students would judge the desserts and the winner would get a prize. While there were a number of ways to ensure victory in the competition, voting multiple times and voter coercion being the most popular (it is Chicago, after all), the proven path to victory was to create a dessert that could be divvied into a large number of portions. One year, the party landed on the same day as my birthday, so I decided to go all out and bake a periodic table of cupcakes. The amazing part of the story was that I was able to sneak in just under 10 dozen cupcakes, decorate them and set up the display without anyone knowing it was my contribution. (Yes, our early-morning classes have attendance problems.) The cupcakes were a huge success and I won the grand prize that year: a cookbook for preparing alligator. No boxes were harmed (or used) in the baking of these cupcakes. Now that the table is complete, a new version is in order. Thursday was Star Wars Day. I used to be able to celebrate by encouraging (umm, FORCE-ing) my students to wear star wars costumes or bring in appropriately themed toys. 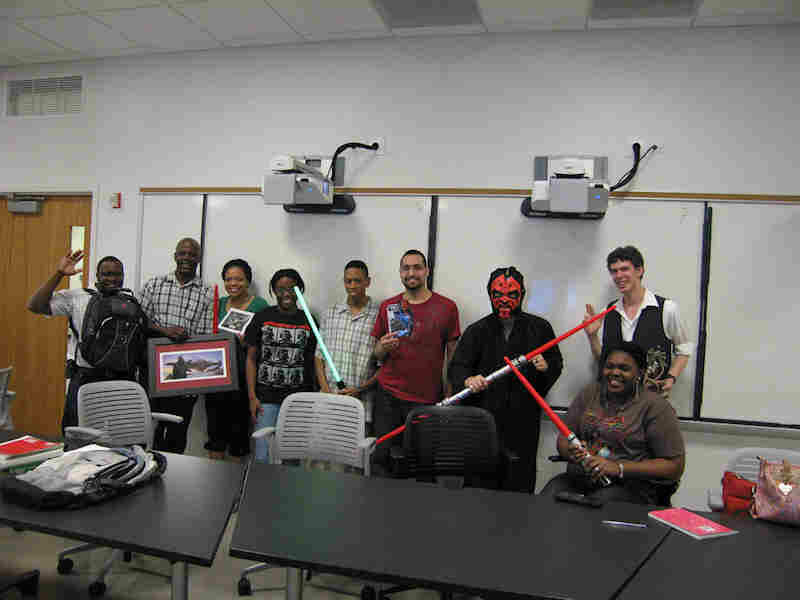 A few years back, my instrumental methods class had the final exam fall on Star Wars Day and participation in the event was near 100%. Offering extra credit was probably the motivating factor. When the test was over, we watched clips from the movie in our Teaching and Learning lab, which is equipped with 18 smart boards, two big LCD screens and Boston Acoustic speakers. Pedagogical validity notwithstanding, it was my first attempt at virtual reality: students could spin 360 degrees and always see light sabers and space battles in bass-thumping surround sound. No grades were influenced by Jedi mind tricks. I’ve got many (many) more pleasant memories related to my time at Chicago State, which brings me to the point of this post: I will be leaving CSU in a few short weeks. This fall, I will start a new teaching position at SUNY Brockport. There are many reasons why I am making this move. I cannot deny that the decision by senior administrators last year to lay off all faculty and selectively recall most of them a month or so later played a role. The apathy that the Illinois State legislature, as well as many state governments in the mid-west, have towards higher education is also a contributing factor. Most importantly, though, is the reality that I need a change of venue if I am to take my teaching, research and other professional activities to the next level. For the last decade, I have learned how to prepare students for careers in science with limited resources in an overly politicized environment. I feel as if I am at a point where I spend too much time relying on established practices and not enough time on innovative strategies. I fear that I have become complacent in my teaching and research. So, after 12 years in Chicago, I will be moving from a medium-size (well, it was when I had arrived) urban comprehensive state institution to a medium-size rural comprehensive state institution. Brockport is more selective and serves a different student body than Chicago State. However, whereas Chicago State can use its minority serving status to support funding requests, I am not sure what strategies Brockport employs to compete for funding with the other dozen comprehensive institutions in the SUNY system. As a state institution, Brockport undoubtedly encounters political challenges as well. I suspect this move is a lateral one, and I am excited to explore how my experiences in navigating an Illinois state school system can be applied to a New York counterpart. I will miss the students at Chicago State, most of whom have shown a level of perseverance and grit that is tough to beat. (My first student co-author on a science article is a mother of 13 children and she now teaches high school Chemistry.) On more than one occasion, I feel as if I have learned more from them than they have from me; and I plan to take that knowledge and experience with me on this new adventure, which may seem like it is in a galaxy far, far away, but in reality is just in a different time zone. Plus, I can reuse some of my costumes and cupcake recipes. Baking cupcakes while building Legos in a Star Wars costume is a completely acceptable mixed-media art form. 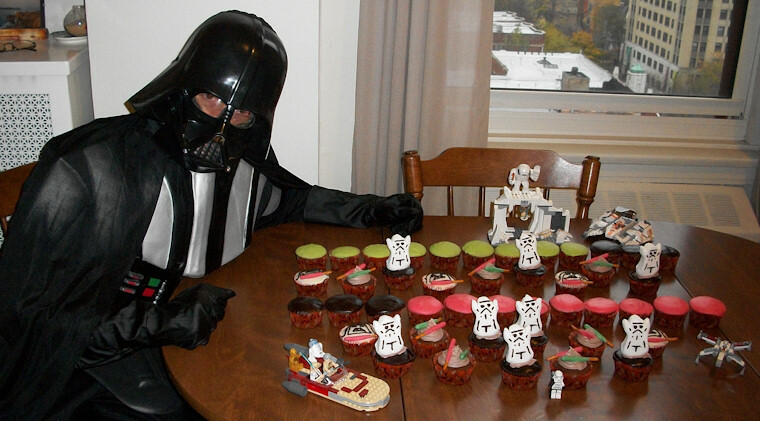 This entry was posted in Bake, Think and tagged Cupcakes, Star Wars. Bookmark the permalink.